CHICAGO — According to The State of America’s Libraries Report released today by the American Library Association (ALA), academic, public and school libraries are experiencing a shift in how they are perceived by their communities and society. No longer just places for books, libraries of all types are viewed as anchors, centers for academic life and research and cherished spaces. As society continues to change the way it consumes information, our nation’s libraries, librarians and library workers continue to mirror the needs of their communities. From offering free technology workshops, small business centers and 24/7 virtual access to e-Books and digital materials, libraries are transforming communities, schools and campuses. Public libraries and librarians are viewed as change agents by addressing unique needs and identifying trends that impact the community. The majority of public libraries offer neutral space for patrons, residents and students to discuss and resolve critical issues. For example the fatal shooting of Michael Brown brought chaos to Ferguson, Missouri. Protests divided residents and caused schools and city services to shut down—but the Ferguson Municipal Public Library stayed open, providing a much-needed safe haven for the community and served as an ad hoc school. Learning is a 24/7 enterprise for students today, and school libraries continue to become invaluable anchors for education environments. Certified school librarians play an essential part in nurturing 21st-century information literacy skills. From collaborating with classroom teachers to designing inquiry-based learning, school librarians are teaching students critical thinking, technology and information literacy skills. Our nation’s academic librarians are working largely with students and academic researchers to help analyze big data. Academic librarians traditionally assess the research needs of academics; however, big data poses new challenges. The sheer quantity and rate of accumulation of data require evolving skills and resources to enable researchers to share, analyze and reuse it. The lack of diverse books for young readers continues to fuel concern. Over the past 12 months the library community has fostered conversations and fueled a groundswell toward activism to address the lack of diversity reflected in children’s literature—both in content and among writers and illustrators. Many federal government policy and regulatory issues are of importance to libraries and the people who use them. Policies related to personal privacy, library funding, workforce development, and copyright law are a few of the issues of interest to the library community. 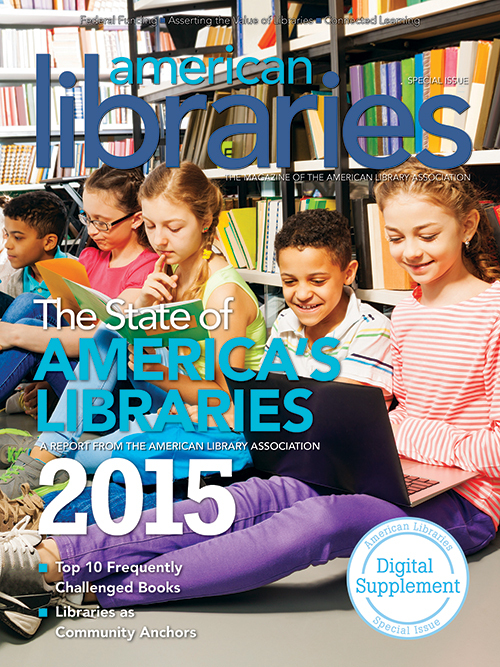 The full text of the 2015 State of America’s Libraries report is available at http://ala.org/americas-libraries. The American Library Association (ALA), the voice of America’s libraries, is the oldest, largest, and most influential library association in the world. Its approximately 56,000 members are primarily librarians but also trustees, publishers, and other library supporters. The Association represents all types of libraries; its mission is to promote the highest-quality library and information services and public access to information.